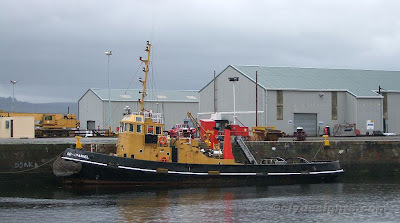 Once a common sight in all military dockyards, the 'Dog' class tugs have been reduced over the years to a mere handful of examples, including two on the Clyde. SD SPANIEL is the oldest survivor, having been built in 1967 by Appledore Shipbuilders and was seen on MOnday in the James Watt Dock. With two new tugs - SD MARS and SD JUPITER - having recently arrived at Greenock, her days are numbered. The 28.65 metre long vessel, which has a gross tonnage of 152 tons, has a bollard pull of 16 tonnes. Many of her sisters have found use in the commercial towage sector since disposal from the former RMAS.